We're excited to announce a new addition to our developer resources. Our CardConnect Developer Guides provide additional information for integrating CardConnect products and services. You can browse the whole library at https://developer.cardconnect.com/guides/home, or jump right to the Bolt Developer Guides to make the most of your Bolt integration. The CardConnect Bolt P2PE API streamlines the integration of our Bolt P2PE validated card-present payment acceptance solution with your software system. The Bolt API, which provides your software with access to the Bolt services. The Bolt terminal application, running on pre-provisioned terminals provided by CardConnect. The Bolt terminal application is EMV pre-certified and enables you to quickly achieve EMV acceptance and PCI scope reduction. The CardPointe Gateway, CardConnect's payments gateway, which provides a complete solution for transaction processing and reporting. CardSecure, which tokenizes payment card information. Your point-of-sale (POS) software, integrated with the Bolt P2PE solution. The CardPointe Gateway API provides additional capabilities not offered by Bolt, including the ability to void or inquire on past transactions. To take full advantage of these features, you must integrate the CardPointe Gateway API into your payment acceptance solution. See the CardPointe Gateway API documentation for information on integrating these features and other advanced capabilities. Your application, which calls the Bolt service endpoints via HTTPS. A terminal device, pre-provisioned and provided by CardConnect. Additionally, integrating EMV acceptance requires your merchant account to be on a CardConnect and EMV-supported processing platform. For more Information on specific requirements contact integrationdelivery@cardconnect.com. Browse the CardConnect Developer Guides library for general information on integrating our products and services, or jump right to the Bolt Developer Guides to make the most of your Bolt integration. Visit the CardConnect Support Site for more details on the Bolt P2PE device integration solution and sample applications. Review the CardPointe Gateway API Developer Documentation for more information on the additional transaction processing and reporting capabilities offered by the CardPointe Gateway, for example the ability to void and inquire on transactions. The following entries describe the Bolt version history and changes to the Bolt API. The new tip endpoint allows you to prompt a user for a tip. You can specify up to four preset tip percentage amounts, including a custom amount option that allows the user to enter a custom tip amount. An updated Postman Collection and additional information for getting started. More detailed and consistent service endpoint descriptions and API documentation. Revised content and improved layout, throughout. The authCard and authManual endpoints now support the optional orderId request parameter. EMV tags are now supported for authCard and readCard requests. See Authorization Response | EMV Tags in the CardPointe Gateway API Developer Documentation for more information on integrating EMV acceptance. The new clearDisplay endpoint sends a request to clear the existing terminal display. The readInput and readConfirmation services now support the optional beep request parameter. The Bolt API now provides convenient authorization methods using the authCard and authManual services. In Bolt v1 and v2 the readCard and readManual services provided the ability to retrieve a token that could be used in a separate call to the CardPointe Gateway's Authorization service. The new authCard and authManual services consume additional payment details and run the authorization automatically, returning not only the token but the entire authorization response using the Bolt API. The readInput service now supports the amount request parameter, which allows users to enter a dollar amount on the Bolt terminal. The new readCard and readManual services simplify and extend card-present merchant capabilities. Requests to these services retrieve tokens which can contain the expiration date, name on card, and signature data. These tokens can then be used in requests to the CardPointe Gateway API Authorization endpoint. The connect service retrieves a session key from Bolt, and uses that key to establish a session between the terminal and Bolt. The session key is then used in each request to the terminal until the session is ended. Terminal sessions allow control of a device during an active session. This is especially useful if multiple clients or workstations are attempting to use the same device. Additionally, the new preconnect service can be used to require two-factor authentication to establish a terminal session. A call to this service displays an authorization token on the terminal, which must then be returned to the POS software to establish the terminal session. Note that this feature requires the merchant account to be configured to use two-factor authentication, and that once two-factor authentication is enabled for a merchant, it becomes required. The readConfirmation and readSignature services are now individual endpoints of the Bolt API. The new readInput service allows the client to prompt the user to enter information at the terminal, and then retrieves that data input from the device. You use POST operations to make requests to the Bolt P2PE service endpoints. The REST Service expects that ALL properties are encoded as US ASCII strings. CardConnect reserves the right to add new key/value pairs within the JSON response. To help you get started with your integration, CardConnect provides a sample Postman Collection that includes a template of the Bolt API service endpoints. Click the following button to download the collection. See Running the API in Postman in the Bolt Developer Guides for information on using the Postman Collection. See the Bolt Developer Guides for information to help you get started, including guides for understanding the Bolt API application workflow and understanding the Bolt API service endpoints. Additionally, see the API Connectivity Guide for information on connecting to the Bolt service and other CardConnect products and services. The following table details each service of the Bolt P2PE API, its associated resource name, and which version it is supported in. The Bolt API version and endpoint name are appended to the base URL. Details about the REST implementation for each endpoint follow this section. See Understanding the Bolt API Service Endpoints for additional information to help you make the most of your Bolt integration. The listTerminals endpoint returns an array of Hardware Serial Numbers (HSNs) for each terminal for the specified merchant ID. This array can be displayed on the terminal, allowing a user to select the HSN, which can then be sent to the calling application. The following key/value pairs are required in the request header. X-CardConnect-SessionKey The session key returned by the connect endpoint. merchantId CardConnect merchant ID, required for all requests. A call to the dateTime endpoint sends a request to the specified terminal to set the terminal's system time. hsn Terminal hardware serial number. dateTime The dateTime value must be formatted as an ISO-8601 local date time (no timezone offset). Hyphens (-) for dates and colons (:) for times are required. A call to the getPanPadVersion endpoint returns the version of the PanPad/Bolt terminal application running on the specified terminal. A call to the ping endpoint sends a ping command to the specified terminal. The response is true if communication with the terminal is successful. You might want to send intermittent ping requests to the terminal to monitor the terminal's connection to the Bolt service. Bolt v1 ping requests do not require a session key. Bolt v2 ping requests do require a session key. connected Returns true if the terminal is connected to the Bolt service, or false if the terminal is not connected. The preconnect endpoint is not required. To use this feature, two-factor authentication must be enabled for the merchant. Note that two-factor authentication is required when it is enabled. The preconnect endpoint initiates a two-factor authentication process between a Bolt terminal and the Bolt service. a successful response displays a 6 character alpha-numeric token on the terminal, which must then be used to make a connect request to establish a session with the Bolt service. The token displays for 60 seconds (configurable), or until a successful connect request is made. To use this feature, two-factor authentication must be enabled for the merchant. Note that two-factor authentication is required when it is enabled. The authentication token value is not case-sensitive. Unlike the connect endpoint, the preconnect endpoint does not include the force property. Therefore, inflight transactions are not cancelled by a preconnect request. Instead, a "terminal in use" error is returned for an inflight transaction. 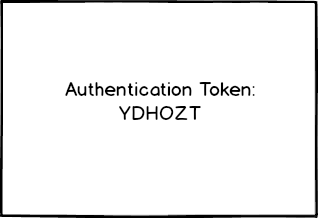 token The 6-digit token to pass to the connect endpoint when two-factor authentication is enabled. This token is displayed on the terminal. A call to the connect endpoint establishes a session between the terminal and the Bolt service. The response returns a CardConnect session key to use in subsequent requests to the terminal. If you use the preconnect endpoint to obtain an authorization token for two-factor authentication, you must also include the token in the connect request. If force is set to true, any existing sessions will be destroyed and all in-flight operations on the terminal will be cancelled. The force parameter is optional and defaults to false. See Establishing a Session for more information. Once the interaction is complete, call the disconnect endpoint to end the session. Otherwise, the session key will expire at the the ISO-8601 expiration timestamp included in the initial connect response. token If two-factor authentication is enabled, you must include the token returned by the preconnect endpoint. This token is displayed on the terminal. force If set to true, any existing sessions are destroyed and any in-flight operations on the terminal are cancelled. If blank, this parameter defaults to defaults to false. X-CardConnect-SessionKey The session key for the established connection. A call to the disconnect endpoint closes the session and releases the session key provided in the request header. "text" : "Try \n Again"
A call to the display endpoint sends a text string, which is displayed on the idle terminal. You can display a single-line or multi-line string. To send a multi-line string, include \n in the text parameter in the request to create a line break. Additionally, you can send a blank string, which clears any existing prompts and returns the terminal display to an idle state. You can also call the clearDisplay endpoint to clear the terminal display. The terminal display is limited to 1000 characters. text The text to send to the terminal display. The terminal display is limited to 1000 characters. To create a line break in the display, include \n. If this field is blank, the terminal display is cleared. A call to the clearDisplay endpoint sends a display command to the terminal with an empty string. This clears the current display prompt. A call to the readConfirmation endpoint retrieves a confirmation response (either true or false) from the specified terminal. merchantId Merchant ID, required for all requests. prompt The text to send to the terminal display to prompt for confirmation. beep Specifies whether the terminal beeps until the prompt is accepted. If true, beep is enabled. If blank, the value defaults to false. confirmed Returns true if the prompt was accepted at the terminal, or false if the prompt was canceled. A call to the readInput endpoint sends a prompt to the terminal to request user input, in a format specified in the request. See Using readInput to Capture Customer Information for more information. The prompt parameter has a 1000-character limit. format The readInput request reads data from the Bolt terminal keypad in the specified format. The format must be a valid getInput format. If true, beep is enabled. If blank, the value defaults to false. The following values are case-sensitive. For example, you must enter "PHONE" not "phone" or "Phone." entering an incorrect value returns the error "errorMessage": "Invalid Format." PHONE Phone Number Entry Use the PHONE format to prompt the terminal to receive a phone number input. The terminal displays a phone number input field with dashes (-). The response returns the phone number, including dashes. AMOUNT Amount Entry Use the AMOUNT format to prompt the terminal to receive an amount input. The terminal displays an input field with a dollar sign ($) and decimal. The returned value is numeric only, with the decimal and dollar sign implied. For example, if "$123.45" is entered at the terminal, the response returns 12345. MMYY Month/Year Date Entry Use the MMYY format to prompt the terminal to receive a month/year date input. The terminal displays an input field with four digits separated by a forward slash (/). The response returns the 4 digit month and year in the format MMYY. For example, if "11/18" is entered at the terminal, the response returns 1118. Nx[,y] Numeric Entry Use the Nx[,y] format to prompt the terminal to receive a numeric input. x = the minimum number of digits. y = the maximum number of digits, up to 32.
y is optional, and if y is not specified, then the input must match the length specified by x. If you specify N5, then the user input must be a 5-digit number, such as "19406." If you specify N5,9, then the user input can be a number ranging from 5 to 9 digits, such as "08081" or "080819876." ANx[,y] Alpha-Numeric Entry Use the ANx[,y] format to prompt the terminal to receive an alpha-numeric input. x = the minimum number of characters. y = the maximum number of characters, up to 32. If you specify AN8, then the user input must be an 8-character entry, such as "A1B2C3D4." If you specify AN1,32, then the user input can be an entry ranging from 1 to 32 characters, such as "A" or "A123." input Returns the input provided at the terminal. The type and format of the input value depends on the getInput format specified in the request. A call to the readSignature endpoint sends a prompt to the terminal to capture the cardholder's signature, which is then returned in the response. The readSignature endpoint is supported for terminal devices that support signature capture. See Capturing and Handling Cardholder Signatures for guidance on how and when to capture signatures. hsn The terminal Hardware Serial Number. prompt The text to display on the terminal. Determines if the captured signature is compressed using Gzip. If true, the signature data returned is a JSON-escaped, Base64-encoded, Gzipped, bitmap (BMP) file. If false, the signature data returned is an uncompressed BMP in base64-encoded. Defaults to true if not provided. Specifies the custom width and height of the signature image, in the format 'x,y'. The maximum value is 999,999. Specifies if the image has a 1-bit color depth (binary) or 24-bit color depth (RGB). This property defaults to binary (1-bit) for BMP and PNG files. JPG files will always be rgb (24-bit). binary - 1-bit; the default for BMP and PNG files. rgb - 24-bit; the default for JPG files, and optional for PNG files. A call to the cancel endpoint sends a cancel command from the POS software to terminate any in-flight operations. A call to the readCard endpoint requests swiped (MSR) or inserted (EMV) card data and returns a token to be used in a subsequent Authorization request to the CardPointe gateway. The readCard endpoint does not initiate an Authorization or capture funds. To use Bolt to authorize and capture a transaction, call the authCard endpoint. See Using the Bolt Tokenization and Payment Endpoints for more information. readCard (v2) requires a CardConnect session key. readCard (v2) is an alias for compositeReadCard (v1). compositeReadCard (v1) does not require a CardConnect session key. amount The amount to be authorized. includeAmountDisplay Determines if the transaction amount is displayed to the user during an MSR or EMV (card-present) transaction. confirmAmount Determines if the terminal prompts to confirm the the transaction amount prior to prompting to insert/swipe/tap the card. includeSignature Determines if the terminal prompts for a signature for devices that support signature capture. The format of the signature data returned depends on the following parameters. If false, the signature data returned is an uncompressed, Base64-encoded BMP file. signatureDimensions Specifies the custom width and height of the signature image, in the format 'x,y'. The maximum value is 999,999. Prompt the user to swipe/dip the card. Prompt the user to remove the card (EMV transactions). Register key presses during PIN entry for debit transactions. Defaults to false if not provided. Sets the default EMV application ID. token The tokenized card data returned by CardSecure. expiry The card's expiration date in the format MMYY. The cardholder's name on the card. The name is not returned if the card or mobile wallet is read through NFC (contactless). Specifies if the token is only valid for a single use. Set to true if the card or mobile wallet is read through NFC (contactless). The signature captured by the request. The signature is a JSON-escaped, Base64-encoded, Gzipped, bitmap (BMP) file unless otherwise specified in request. "signature" : "<base64-encoded, gzipped BMP>"
A call to the readManual endpoint requests manually-keyed card data and returns a token to be used in a subsequent Authorization request to the CardPointe Gateway. The readManual endpoint does not initiate an Authorization or capture funds. To use Bolt to authorize and capture a transaction, call the authManual endpoint. readManual (v2) requires a CardConnect Session Key. readManual (v2) is an alias for compositeReadManual (v1). compositeReadManual (v1) does not require a CardConnect Session Key. Determines if the terminal prompts the user to enter the expiration date for the card. Determines if the terminal beeps to register key presses. A call to the authCard endpoint requests swiped (MSR) or inserted (EMV) card data and initiates an Authorization request to the CardPointe gateway. The Bolt API does not provide the ability to void or inquire on transactions. See the CardPointe Gateway API documentation for information on integrating these features and other advanced capabilities. The CardConnect merchant ID (MID) that is associated with your Bolt terminals in the CardConnect terminal management system. The merchantId can be different than the authMerchantId, however both values must belong to the same customer account. This value is only required if the authorization merchant ID is different from the Bolt terminal merchant ID. The authMerchantId and merchantId must belong to the same CardConnect customer account. This setting must be enabled for your merchant account. Contact integrationdelivery@cardconnect.com for additional information. amount The amount to be authorized (and captured) for payment. If true, the signature data returned is a JSON-escaped, Base64-encoded, Gzipped, bitmap (.bmp) file. If false, the signature data returned is an uncompressed, Base64-encoded bitmap (.bmp) file. Determines if the user is prompted to enter the billing zip code for the card. If true, prompts the user to enter the zip code. Determines if the user is prompted to enter the Card Verification Value (CVV) for the card. If true, prompts the user to enter the CVV. Captures the amount for settlement within the authorization request. If set to false, the authorization (retref/authcode) must be captured in a separate request in order for the merchant to receive funding for the transaction. Enables optional userFields to include additional data in the authorization request for future retrieval. The value of the userFields object (or array) is a series of name-value pairs that are meaningful to the merchant. The name and value can be any string and the total length of user defined fields (URL/JSON-encoded) is limited to 4000 bytes. An optional order ID used to associate the transaction with an order identifier. It is strongly recommended that you populate this field with a unique value. The orderId can include alphanumeric characters and has a maximum string length of 19 characters. Specifies the number of milliseconds to wait, after an authCard request completes, before clearing the authorization status from the terminal display and returning to the idle display. Set to 0 to disable clearing of the display after an authCard request. If not provided (null), the default delay configured in Bolt will be used. See Authorization Response for details. A call to the authManual endpoint requests manually-entered card data and initiates Authorization request to the CardPointe Gateway. Determines if the transaction amount is displayed to the user during an MSR or EMV (card-present) transaction. clearDisplayDelay Specifies the number of milliseconds to wait, after an authCard request completes, before clearing the authorization status from the terminal display. The tip endpoint is only supported on terminals running firmware version 1.6.3.4. A call to the tip endpoint prompts the user to specify a tip amount on the terminal. See Using the Bolt API Tokenization and Payment Endpoints for more information. hsn The terminal hardware serial number (HSN). The text to display to prompt the user to select or enter a tip value. Ingenico iSC 250 terminals are limited to a maximum of 53 characters on single line. The prompt text cannot include the word "amount"; however, "Amount" is acceptable. The terminal returns a cancel response if "amount" is present. Amount must be a numeric value with 2 implied decimal places (for example, to specify "$10.00," enter "1000"). Determines if the subtotal (amount) and total (amount + tip) is displayed on the terminal. Determines if a custom tip button is displayed on the terminal. Specifies an array of three preset tip percentages. Note: The ability to set four preset values is planned for a future enhancement. amount The amount provided in the original request. tip The calculated tip amount based on the user's selection or input. total The calculated total transaction amount (amount + tip). A 200 response indicates that the request was completed successfully and includes the response body. A 400 response indicates that the request could not be completed due to invalid or missing information in the header or body elements. Error Code 3 is a generic code, which includes an error message that provides specific contextual information for the error, based on the request. The following table describes Error Code 3 conditions that can be returned for calls to each endpoint. An HTTP 401 response indicates an authentication error. Authentication errors can occur when the API key is invalid or missing from the Authorization header, the merchant ID is missing from the body or does not match the API key. Authorization errors can also occur due to a terminal configuration error in TMS. a 403 response indicates that the request included an HSN value that does not match the specified merchant ID. A 500 response indicates a Bolt client or Bolt server error. The response includes an error code, which corresponds to one or more specific error messages that describe the error. Attempting to connect to a terminal with an active session, and the force property is set to false. Error codes are fixed; however the error messages associated with each error code are subject to change. See 500: Bolt Client or Server Error for more information.